Last night, Acrobatic Conundrum performed its show The Language of Chance to open a two-week series of circus events at Seattle's 12th Avenue Arts, and the show was spectacular. Imagine a Cirque du Soleil quality performance at an intimate venue without the expensive ticket, and you'll have some idea of what transpires at the Acrobatic Conundrum's performances. "It felt tremendous to be in the audience with so many great artists, being treated to such an authentic, strange, and beautiful performance by the Acrobatic Conundrum. The show was a true ensemble show, a seamless evening of circus-physical-theater, which I guess you could call 'contemporary circus'. But I think by calling it "contemporary," one loses the timelessness of really darn good narrative, of humans struggling with human themes of humor and absurdity." Everyone in this troupe is a star, and yet each character also steps back to support the others in some feats of daring that left me continually wondering, "how can a person do such a thing with their body?" Thus, I consider The Language of Chance to be a perfectly performed and staged show filled with every human emotion. 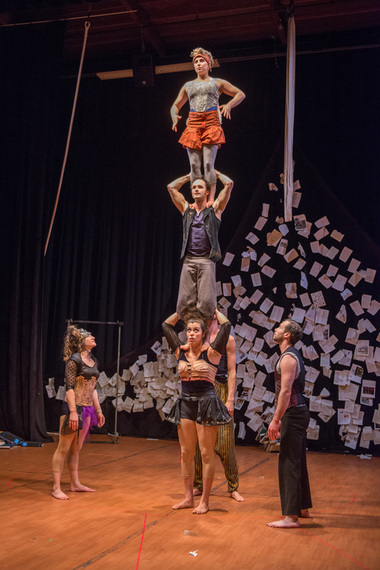 Although The Language of Chance runs only through April 29, Acrobatic Conundrum's Three High Circus Series continues at 12th Avenue Arts in Seattle through May 10 with several unique and interesting shows. It's a rare and auspicious opportunity to see amazing talent in an intimate setting for a very reasonable price. May all people find their true gifts and share them as the performers of Acrobatic Conundrum's shows are doing.